It doesn't fit the wordplay but I read that croissants originate from Vienna too. 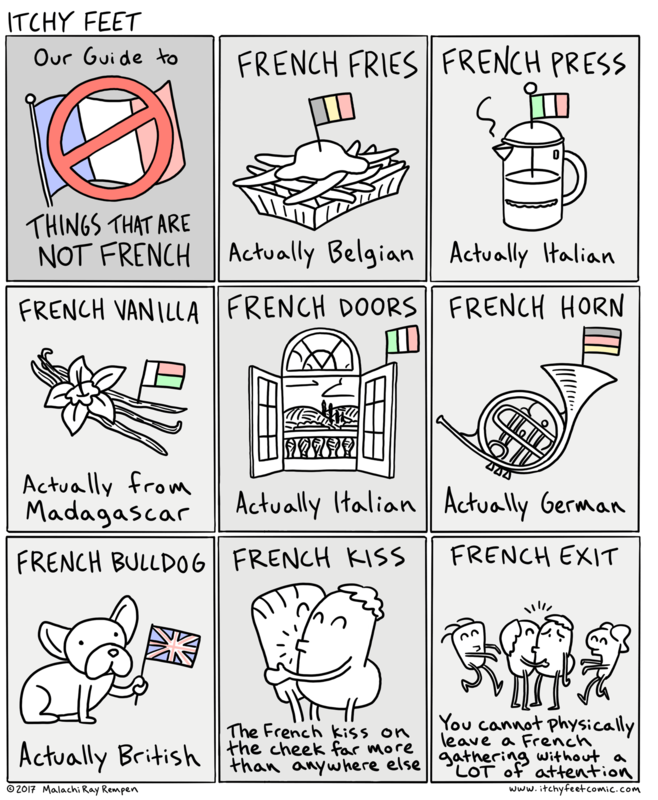 I wonder if the French claim these things as French or if it's just the rest of us? Rest of the world. I have not seen French fries anywhere here, only 'frites' or 'pommes frites', and vanilla is sold as Madagascar vanilla or Bourbon vanilla. In France, croissant and similar baked goods are called «viennoiseries». Croissants are sold as croissants here in France. Croissants, pains au chocolat et brioches retrouvent grâce aux yeux des Parisiens. And actually, they don't even kiss _on_ the cheek. What's funny is that in French it is called as "leave English-style" (filer à l'anglaise). It seems that those two nations located on opposite sides of the Channel just love to call strange thing by the other's name! In Hungarian, it's "angolosan távozik" (also, leave English-style) when someone doesn't say goodbye to anyone, just leaves. This makes me wonder: have you done a comic on what the Dutch call "to go Dutch"? (As in, for each person in a group to pay their own way.) They call it "going American. I thought vanilla bean was from Madagascar or other regions and French Vanilla was actually French in the way ice cream was made. Fun fact: A "french kiss" was so called because the English used to consider it vulger and dirty. The French called it an "english kiss" for the same reason. England and France used to really hate each other. In some ways, they still do! I got one; French toast: actually American.